The Ministry of Culture of the Slovak Republic, in cooperation with the Ministry of Finance of Slovak Republic set up an expert group which assembled to solve the issue of the state financial support to the churches and religious societies. Goal of the meeting was to search for a model to separate financially church and the state and to search for a better model of financing churches in Slovakia. In order to do this, the executive requires an inventory of the property value from churches. However, government did not come to an agreement even in the following session in February 2013, although it has still declared an interest to change the financing scheme of churches in Slovakia. According to the statement of the nunciature from 9 July 2012, after careful consideration and prayers Pope Benedict XVI asked archbishop Bezák to resign. At the same time, it was agreed that Bezák meets the prefect of the Congregation for Bishops. However, this meeting did not take place. Róbert Bezák refused to resign. After that, Pope removed Bezák from the pastoral management of the Trnava Archdiocese effective from 2 July 2012. This removal produced mass reaction among Slovak citizens and attracted media attention. A week later, on 10 July 2012, the Bishop’s Conference of Slovakia published a statement announcing that it "accepts Holy Father’s decision with deep respect and filial obedience and appeals to all for accepting Holy Father’s decision with respect and trust". The statement also highlighted that the involved are acquainted with the results of apostolic visitation and that these shall be treated with confidentiality. The Bishop’s Conference of Slovakia (KBS) accepted the decision about the removal of Bezák without reservation. Doubts, whether Bezák had really been removed by the Pope, were dispelled by Benedict XVI in his letter from 18 October 2012 to the Chairman of the KBS Stanislav Zvolenský, in which he thanked him for "the show of deep church community [...] after the painful matter with the H. Ex. Mons. Róbert Bezák CSsR". In this letter, Pope states explicitly : "I have acquainted myself carefully and objectively with a serious and disturbing situation. After a long prayer, I could not avoid the duty resulting from love to restore an efficient collegiality among you and an organized pastoral management in the Trnava archdiocese, in the authentic spirit of The Second Vatican Council." During the pilgrimage to Šaštín at the occasion of the Feast of Our Lady of Sorrows on 15 September 2012, several pilgrimage participants expressed their support for Bezák by banners and billboards. MVK survey Agency, which organized virtual presidential election in January 2013, included Róbert Bezák among the candidates. He won the virtual elections with a score of 35,3 %, which is 6 % more than the current prime minister Robert Fico who obtained 29,0 %. In May 2013, a petition was sent to Pope Francis. It had been launched on 9 January 2013 by a civic association Pastor bonus. The petition includes approximately 15 thousand signatures. Signers asked the Pope "to consider reasons for removing the archbishop emeritus and appeal to meet him in person, hear him out and after that consider either his further activities in the Church or rehabilitation.". On 11 July 2013, Pope Francis designated Ján Orosch, the apostolic administrator of the sede vacante, as the new Trnava diocese archbishop. See more : Wikipedia and Catholic hierarchy. 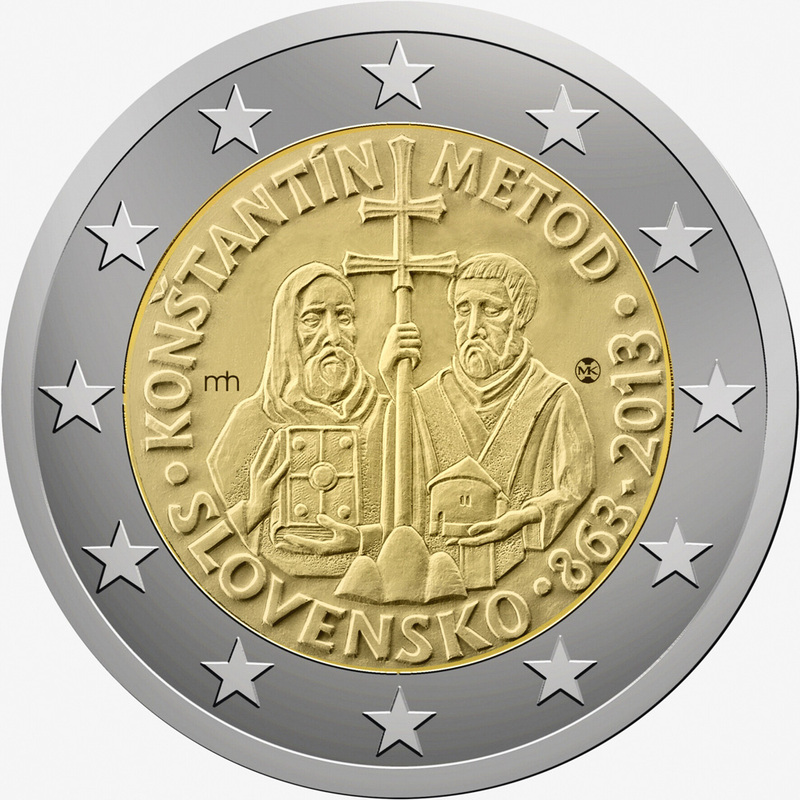 Slovakia planned to put into circulation a two euro coin in May 2013 to commemorate the 1150th anniversary of the arrival in Great Moravia of Cyril (Constantine) and Methodius, who came to evangelize the Slavic peoples. 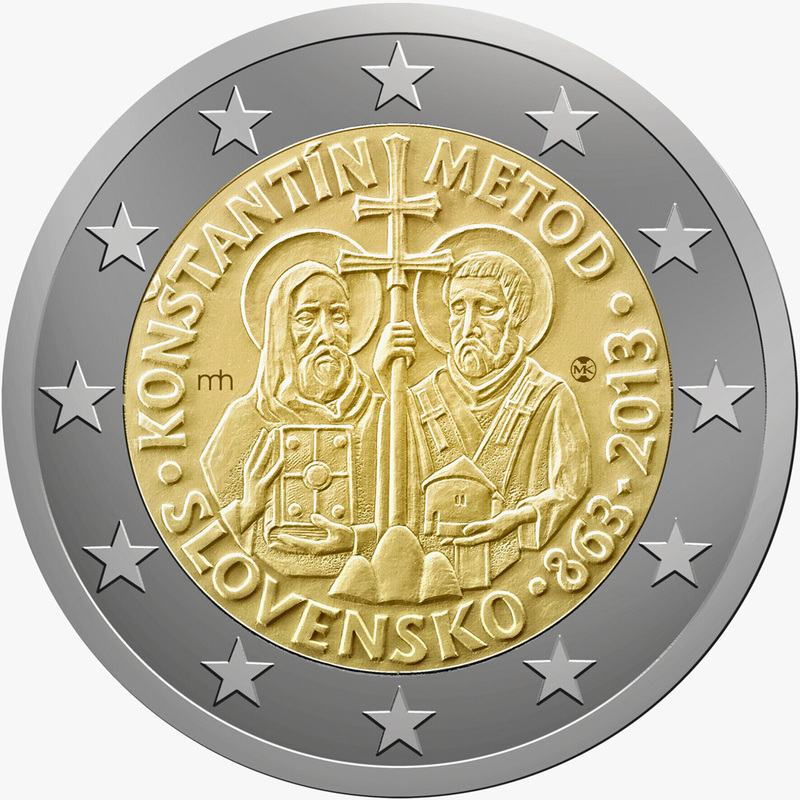 The design intended to adorn the national side of the coin has, however, been subject to challenges from several Member States who wish for the haloes above the heads of the two saints and the crosses appearing on the pallium of one of them to be removed, out of respect for religious diversity guaranteed by Article 22 of the Charter of Fundamental Rights of the European Union (press release by the Slovak National Bank (NBS) of 21 November 2012). EC Regulation no. 975/98 (as amended) provides in effect that “the issuing Member State submits to the Council, the Commission and other Member States whose currency is the euro, plans for the designs of coins intended for circulation” and that “any Member State whose currency is the euro may, in a reasoned opinion addressed to the Council and the Commission, lodge an objection to the design plans proposed by the issuing Member State, if the design is likely to cause adverse reactions among its citizens” (Article 1(i)). The Slovak National Bank initially decided to accept the modifications requested and designed a new coin, albeit keeping the double cross held by the saints, which, by the way, is also reproduced on the country’s coat of arms. Following a meeting of its Board of Directors on 23 November 2012, it finally declared its wish to return to the initial design plan, after a change in the Commission’s position on this issue (NBS press release of 23 November 2012). Based on government’s declaration from 24 April 2012 it could have been assumed that two bank holidays were to be abolished, one of them being a Catholic one. The request to decrease the number of days off was raised by the employers. Government proposed to abolish two bank holidays – Feast of Our Lady of Sorrows on 15 September and the Constitution Day on 1 September. Catholic organizations initiated a petition to keep the Feast of Our Lady of Sorrows, which was signed by approximately 130 thousand people. The Opposition also requested to keep this bank holiday. After submitting the signature sheets to the Governmental Office at the beginning of 2013, no further discussions were held to the issue and the number of bank holidays in Slovakia remained the same.